Kim Hyun Joong from the group SS501 is scheduled to perform a song called 'The power of smile', composed by Komuro Tetsuya on the 14th at Tokyo Dome, a composer whom Japan holds with pride. Recently, Kim Hyun Joong has done an interview with NocutNews and hinted, "'Project Smile' that will be held this month on the 14th at Tokyo Dome, I will be singing a song composed by Komuro Tetsuya. Komuro Tetsuya is a famous composer and music producer in Japan. " "Smile Project" is a charity programme by Asia Entertainment DATV as its charity project for children in Asia. For 'Project Smile', Komuro tetsuya has composed "The power of smile". Komuro Tetsuya is the "Golden touch" in the Japanese music world. He has done productions and composing for trf, EUROGROOVE, Hitomi, H.A.N.D. Female singer Amuro Namie who represents the popular Japanese pop music has acheived great success as a solo due to her being single out by Komuro Tetsuya. Therefore, this performance is of positive influences and impact to the next generation of Hallyu star, Kim Hyun Joong. In addition, Bae Yong Joon and Hwanhee, who are both from the same company as Kim Hyun Joong will also be appear at 'Project Smile'. 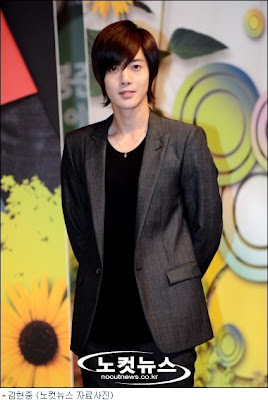 On that day, Kim Hyun Joong is scheduled to perform Komuro tetsuya's work, Television drama "Playful Kiss" main OST as well as a new arrangement of his own hit song.